I’ve been noticing with special clarity lately how vastly dependent “good” and “bad” is on perspective. It’s always been there. What’s fat or skinny, what’s rich or poor? And yes, even what’s good or bad–it’s all completely subjective. I’ve done enough weight loss support and talked to enough Tarot clients to say this without hesitation! What’s more, these designations will alter not based upon the circumstance, but ALWAYS based on the in-the-moment perspective of the individual. The job that seemed utterly perfect at one point may be considered the worst ever at another point (or even another point in the same week). Same for the relationship or the house or the car or whatever it is you’re concerned with at any given moment. People I consider thin may worry about their weight. People who seem rich to me can be upset about money. It’s an internal state, NOT an external one. And however you feel is however you feel and there is no rightness or wrongness about that. It just is. And it makes sense to make peace with wherever you are at, because what choice do you have? It’s current. It’s where you are at. Feeling crummy about it doesn’t change it. It just makes it harder to change it. That’s not equivalent to resignation, by the way. It’s actually what unsticks you, not anchors. Being at peace with where you are gives you a choice where you go with it. You can lean into whatever feels a little better, a little more satisfying, from wherever you’re at. That can be steered with just a little effort, caring about feeling better over other considerations. Choosing the thoughts you follow based on what soothes. Or you can lean into worry and tension and upset. It’s always up to you, which way you lean from where you’re at. And I’m not going to tell you one is right and one is wrong, because I don’t see the world that way. But I will tell you, one feels better. That’s the one I like to pick. And that’s the topic of the Tarot forecast for next week. This week, for outlook we have the Nine of Cups (Water) with advice coming in as the Seven of Wands (Fire) from The Good Tarot. Now, the Nine of Cups is definitely a card of satisfaction–a wish being fulfilled. (Were you wishing for Mercury to go direct? Granted!) So I would expect to have some relief in the coming week if you’ve been struggling. And if not, still expect there to be icing on your cake, okay? This looks good to me. Interesting in terms of advice, though…that Seven of Wands. To keep the “satisfaction vibe” active, you may have to reject or ward off the opinions of others. This is easier to do than you may appear at first glance, but it definitely takes practice. What someone else thinks of you? Doesn’t matter. Whether or not anybody else agrees on what’s best? Doesn’t matter. Who approves of what or how many people sign on to your vision? NONE of this matters, not even one tiny little bit. Insecurity fuels seeking outside validation. That’s a short-lived reassurance because it can and does change based on where someone else is at, at any given moment. The only lasting form of security comes from within. There is no other route. You be your fancy, unique Unicorn self and *%#% the rest of anything else, okay? And if you want a one-on-one check to clear your head here, give me a holler. Besides my life here in the woo, I am also a low carb blogger who has been blessed with a growing audience. So people sometimes ask me for advice. But people will think I’m nuts if I tell them the truth. See, they always ask process questions. They are looking for a formula they can follow to recreate the results. I get that. Those were the questions I used to ask, too. But if I’m being completely frank, at this point I consider the processes utterly incidental to the results. Not just less important. Incidental. At best, if the processes give you confidence, the confidence can be helpful. If they leave you with doubt, they will hinder you. It’s not the choices you make. You could say “yes” to something and be right. You could say “no” to that same something and be just as right. It doesn’t matter. It’s the beliefs you bring to the table, the energy you’re working with here. I tried very hard to get where I wanted to be via the sheer force of hard work. And I should have been able to do it! I stumbled into every single advantage you could imagine in this enterprise and worked my hiney clean off trying, trying, trying. Except nothing really worked, no matter how hard I worked. So eventually, I gave it up. Instead, my involvement in the topic shifted to doing whatever I felt like doing whenever I wanted to do it, with zero expectations of traditionally recognizable success. As a matter of fact, a friend started helping me with it and I completely stepped back from the whole shebang. That’s when everything started clicking, and rapidly. I wasn’t even doing any work anymore…how’s that for irony? In the course of stepping back, I had quit asking “how” and “when.” I knew what I wanted to accomplish–to be helpful and supportive. But in terms of how anything was going, I stopped keeping track. My doubts and frustrations and all that noticing what wasn’t working became a non-issue. In short, I got out of my own way. Maybe this sounds like a fluke to you. But I’ve seen it in play so many times since, I don’t have any questions about it myself. It’s one of those things you pretty much have to experience for yourself. This coming week, the cards spoke to me of this sort of situation. Here we have the King of Air (aka the King of Swords) from the Good Tarot, along with False Indigo from the Botanical Inspirations deck, associated with Immersion and Intuition. At first glance, these two cards seemed almost a contradiction together. The element of Air is associated with logic, clarity, and thought. Solid, immutable fact would be the domain of this king. Conversely, intuition and immersion would imply the element of Water. Fluid, flexible, a “knowing” without justification is the domain of intuition. But really, these two energies make an incredibly potent combination. Kings are do-ers, taking an active role in their creation. But the King of Air in particular is also a thinker. He does not make a move without purpose. So we’re looking at knowledge versus knowing. Here is the trick–think about what you want, not how you will get it. Become clear about your objectives and how you want to feel. Immerse yourself in the clarity of THAT energy, getting the sense of what sort of outcome you want, without trying to dictate the how-to-get-there part. Intuition will carry you forward much quicker and more smoothly than your brain alone ever could. Thoughts shape feelings, which provides a perfect indicator of the energy you’re flowing in any given moment. It’s not the doing that matters–it’s the energy flow. THAT is how you create reality. So think your thoughts, clearly and as cleanly as you can and note the emotions that result. If the emotions are pleasant, turn up the thoughts! Enjoy them and know, you’re shaping the energy right there. And if the emotions don’t feel so good? Back off. Now is not the time to take action on that particular issue. Get yourself clarity. Get the emotions on track and let everything else come together for you. Want some help doing that? Holler at me for a consult. I’m doing my best to take responsibility for my own sense of well-being. This practice is centered around a pretty hard-for-me-to-argue idea. That’s certainly been my experience, anywho. Obviously, I am not gonna love everything and everybody, all the time. I’m way not Jesus! And I’m not trying to deny myself acceptance, those times I’m more storm clouds than sunshine. All feelings are valuable. Feelings help you navigate from wherever you find yourself, back to who you really are. I just like being happy. I like feeling good. And I’ve found my world runs better if I pay less attention to who else is right, and more attention to what’s right for me. It feels better that way. Nobody else can mess up my world. Not permanently, anyway. What goes on in my head is what is determining my experience, whether my perspective feeds my happy or starves it. I like to feed the happy. It’s my aim to love whatever good I can find, anywhere I can find it. I go out there intentionally seeking life’s sparkles and shiny bits. Making a habit out of it day after day after day until it comes as naturally as breathing. And if you make this one of your intentions and practice it? You’ll start to see more and more of those shiny bits. Your life will become awash in blooms. Our guidance comes in the form of the Eight of Air from The Good Tarot (better known of as the Eight of Swords). Isn’t it a pretty deck? 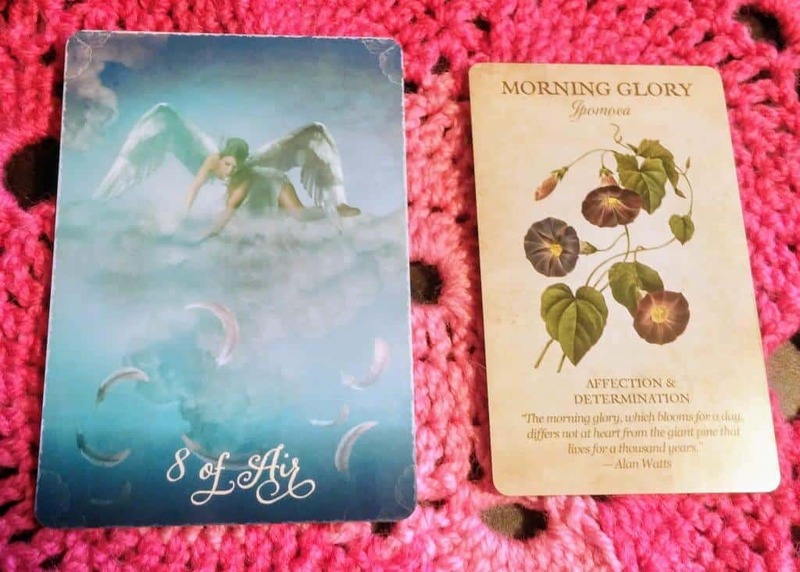 And from the Botanical Inspirations deck, the Morning Glory–associated with Affection and Determination. The Eight of Swords is an old friend to me (or nemesis,whatever). This card encourages us to open our eyes and look around honestly, without the distortions of fear, guilt or self-criticism that keep us paralyzed. It’s a time to look at ourselves less critically, from a higher perspective and release the illusion we have no choices. All roads lead home/dixiblog/domains/afoolsjourney.com/public_html. Damnit. Morning Glories hold a special place in my heart. I’m surrounded by their delightful bursts of color each spring and summer on my front porch. Each year, they manage to surprise me anew with their ingenuity and will to spread more even profusely, further and further from where I originally plopped them into the dirt. Like blessings that insist on multiplying. To me, Morning Glories wonderfully embody the concept of being fully present in the moment. The Morning Glory graces anyone nearby with a spectacular show of stunningly colorful blooms. But you cannot see those same blooms tomorrow! Nor will you see yesterday’s blooms today. The only blooms you ever see on a morning glory are today’s blooms. It’s now, now, now. And each night, today’s beautiful blooms quietly wither and drop, making way for tomorrow’s batch of floral goodness. The future takes care of itself as the pods from spent blooms transform to seed and in doing so, make way for next year’s joy. With amazing determination and tenacity. In short, be determined to express your affection. Start by aiming unconditional love straight at yourself. Back off anywhere you’re not grooving the loving vibe and actively seek out the blooms of the moment. Look for all the good you can find. Now. And now. And now. You’ll get a better handle on your own happy and you’ll become an expert at finding things to be happy about. And if you want some help re-orienting your perspective? Give me a holler for a session.